Q&A: How Are Participants Assessed Prior to Coach Assignment? 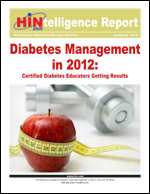 Free Download: Diabetes Management in 2012. The first motivational interviewing (MI) video training series especially designed for clinicians who serve individuals at risk of, or affected by, chronic diseases. This series will help build the practical MI knowledge and skills needed to support patient health and address the behavioral factors that are responsible for over 85 percent of avoidable healthcare costs. Order your copy of this video training series today. "We have red flag rehearsals, which allow a patient to know the signs and symptoms of a worsening condition and what to do for it. We reinforce the discharge instructions because it's a 'one-patient-one-record' mantra." Watch the webinar today or order a training DVD or CD-ROM.